The category of genever is worthy of a book unto itself [and fortunately there is, Van Acker – Beittel’s work is incredible]. Genever is rarely considered as gin, but it’s worth being thought of as the grandfather of gin. It is the spirit drink from which gin descended. 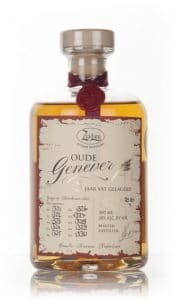 Genever can be broadly divided into three categories based on how much malt wine and how much sweetening has been added. The least maltwine is in the Jonge styles, while the Oude, the more traditional has more than Jonge’s. Korenwijn has the most malt wine, requiring at least 51% by volume. The malt wine is mixed with a more traditionally distilled neutral base spirit which includes botanicals, of which juniper is typically included. Genevers are malty and grainy, with the grain base adding much of the character to the final spirit. However, unlike Holland Style Gins which can be produced anywhere in the world, Genevers are geographically protected by law and can only be distilled in the Netherlands, Belgium and a couple counties in France and Germany.